The Belgian Groenendael, as it is called worldwide, is simply called the Belgian Shepherd by the American Kennel Club. It was named after the village of Groenendael in Belgium. It is one of the four varieties of the Belgian sheepdogs, the Belgian Groenendael, Belgian Malinois, Belgian Tervuren, and the less popular Belgian Laekenois, that all share a common foundation. In most countries and breed clubs all four dogs are considered the same breed with different varieties in coat types. All four dogs share a breed standard in all countries except for the AKC, which since 1959 recognizes them as separate breeds and does not recognize one of the four (the Laekenois), whereas the UKC, which is also a U.S. registry, does recognize all four varieties as one breed. Versatile and highly intelligent, all four varieties of the Belgian sheepdog excel at a variety of talents, including but not limited to, police work such as, narcotics and bomb detection, protection and Schutzhund, search and rescue, also obedience, agility, tracking, herding, sled and cart pulling and as a guide for the blind and assistant to the disabled. Today all four sheepdogs are popular in Belgium, with the Laekenois and Malinois more often used as working type dogs than the Belgian Groenendael and Tervuren but all types still making excellent workers. This stunning Belgian Sheepdog is a very athletic and able dog that is alert, intelligent yet also a very good companion dog. They are very similar in overall appearance to the German Shepherd although the Belgian Sheepdog is typically all black or black with a very slight amount of white allowed on the chest and the muzzle, with white tips allowed on the hind toes and between the pads of the feet. As a flock protector and herding dog the Belgian Sheepdog must be intelligent and somewhat independent, protective and gentle, as well as obedient and able to think through problems without the help of the owner or shepherd. The result is a very intelligent, active and alert dog that is capable of working on its own as well as responding unhesitantly to the owners instructions and commands. Of course this kind of response takes time and practice to develop. The Belgian Sheepdog is a very sensitive dog and will respond to the slightest sound of disapproval in the owner's voice. Without proper socialization they can become timid and very shy, or may also become overly aggressive if they feel trapped or cornered. With proper socialization from an early age the Belgian Sheepdog will be a very well-adjusted and well balanced dog, good as both a companion and a family protector and watchdog. The Belgian Sheepdog is a good family pet for those with small children or families provided the puppy is socialized with children and becomes accustom to the movement and loud noises associated with small kids. They will typically bond with one or two people in the family the strongest, but will love attention from everyone. They will listen and respond to children and are very obedient although not typically highly playful dogs. The Belgian Sheepdog is naturally very protective so care needs to be taken when introducing strangers and new people. A Belgian Sheepdog can be trained to live in a house with other dogs and pets, although introductions and socialization should be done slowly and with lots of supervision before leaving the Belgian Sheepdog alone with dogs or other pets. They do have a tendency to chase, especially cats, but if raised as a puppy in a house with cats they are much more accepting. They do best with a companion dog that is of a non-dominant breed and will typically get along best with a spayed or neutered companion dog of the opposite gender. The Belgian Sheepdog should never exhibit signs of aggressiveness or viciousness or fearfulness. Either of these characteristics, aggression or fearfulness, should disqualify the dog for any breeding programs. 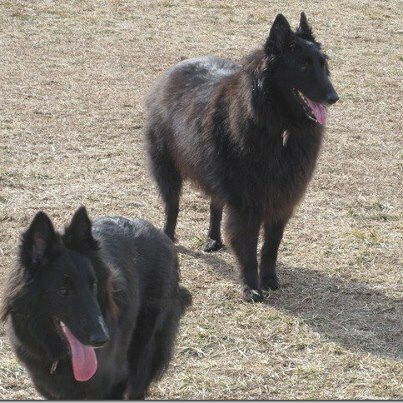 The Belgian Sheepdog has been very fortunate in avoiding some of the poor Breeding practices that have resulted in many genetic conditions that are problematic in other breeds. The Belgian Sheepdog is one of the breeds of dogs that "blows" its coat in the spring and fall. This means that the winter and summer coat is lost in a very heavy shed twice a year. The Belgian Sheepdog actually has two coats. The outer coat is thicker, coarser and designed to provide protection and waterproofing. The inner coat is softer, shorter and denser, adding insulation for the dog. When shedding the inner, softer coat often becomes matted or tangled with the longer, outer coat resulting in thick, knots of hair that may need clipping to be removed. To prevent this daily grooming is recommended. The Belgian Sheepdog is a working or herding dog, and must be exercised mentally as well as physically. They need to feel that they have something to do or a task to complete, even if it is protecting the property or escorting you on long walks. The Belgian Sheepdog will often turn to destructive type behaviors such as chewing, digging, barking and even finding ways to get out of the yard if they are not given the right amount of exercise and human contact. Since the Belgian Sheepdog is such an obedient breed of dog by nature they are excellent in obedience and agility type competitions as well as in herding events. Even for owners that don't want to formal compete with their dogs they may wish to consider taking an obedience class and working with the dog as a way to provide both mental and physical exercise. The Belgian Sheepdog will also get a fair amount of exercise if left outdoors with a companion dog or even by themselves. They are natural patrol dogs and will walk around the yard, checking their area and providing protection. They do need room to run and explore and if kennelled or kept in the house for longer periods of time they will need longer walks and more routine exercise periods. The Belgian Sheepdog makes a great jogging dog or hiking companion. They have a seemingly endless amount of stamina are able to keep up with even the most avid runner or hiker. They also, of course, work livestock with little or no formal training which is an excellent way to provide mental stimulation and lots of hard, intense physical activity. The Belgian Sheepdog prefers exercise off the leash where they can run and stretch their legs, yet still stay close to the owner. Training the Belgian Sheepdog requires a trainer that knows how to work with a dominant and intelligent breed without using any harsh punishment or training methods. The Belgian Sheepdog needs to be treated firmly and positively to allow them to develop their strong bond with the handler. Dogs that are yelled at or punished will become fearful or aggressive rather quickly. Starting training very early is important with this breed, especially the socialization aspects of training. A puppy obedience class is highly recommended for either male or female Belgian Sheepdog puppies. Working with the dog on a regular basis is also key as this dog needs to feel that it is helping out the family and actually has a job to do. Since the Belgian Sheepdog is a naturally protective dog there is little need to specifically train for this, other than to teach the dog to stand down when strangers approach. Again, socialization and trust between the dog and the owner will be key elements of this type of training. They are not problem barkers but do need to learn to stop barking when commanded to do so. A trainer or just using a diversion such as a treat or a favorite toy will often stop the barking and then reward the dog for being quiet. One of the wonderful features of this breed is that they will respond very well to children. Often kids love to compete with the Belgian Sheepdog in obedience and agility events simply because they are a naturally obedient dog. Working with the dog on a daily basis on both exercise and fun activities as well as commands and behaviors will help the dog feel needed and active in the family.